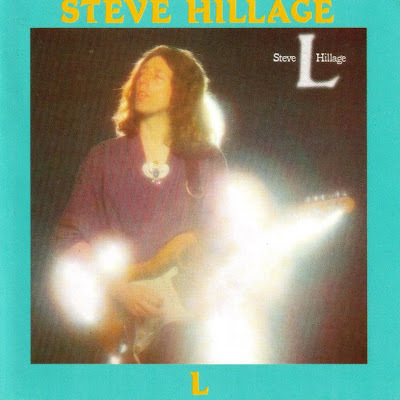 Hillage’s sophomore album L featured another round of guest musicians, albeit this time from America. Recorded at Bearsville studios in New York, Todd Rundgren took the production duties and his Utopia compatriots subbed as the backing band. Roger Powell manned the keyboards, while Kasim Sulton and John Wilcox filled the rhythm section. The album opens with a cover of Donovon’s "Hurdy Gurdy Man", though Hillage’s signature is all over it. Far more interesting is the original "Hurdy Gurdy Glissando" that follows. Guided by a tabla rhythm, it slowly rises before erupting into a hyper kinetic jam – one that even bordered on the fusion end of things. The Utopians are a strong cast, but in particular John Wilcox’s manic drumming is often overbearing. The second side’s major track is the twelve minute "Lunar Musik Suite". Thrust open with Hillage’s Arabic guitar line soaring above a sequencer loop, in seconds any subtlety is lost once Wilcox’s pounding beat kicks in. The track then takes a far more celestial pace and things get infinitely more interesting. Don Cherry adds some trumpet, a unique combination, before the track turns all Hillage at the end. His guitar playing is exceptional throughout the album, relying on speed and fluidity more than his usual trademark echo. Despite another plodding backbeat, the closing track is a rousing cover of George Harrison’s "It’s All Too Much". It failed to chart as a single, but the album would be Hillage’s most successful, reaching the Top 10 in the UK. Hillage then assembled his first band. With the his ever-present partner Miquette Giraudy on vocals and keyboards, the first incarnation featured Colin Bass on bass, ex-Tull drummer Clive Bunker on drums, Basil Brooks on keyboards and synthesizers, and a second guitarist in Frenchman Chrisitan Boule. The band even made it to the US in support of the Electric Light Orchestra. Hillage with new faces all round.Great stuff! Thanks Oleg.